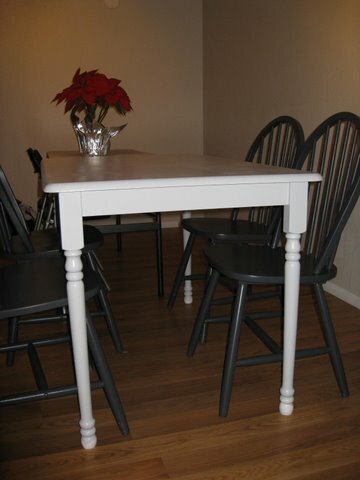 Between Christmas and New Year’s I finally repainted the table and chairs I bought from a friend last summer. I waited until it wasn’t summer, both because it’s uncomfortable to paint outside when it’s so hot and also because it’s actually beyond the temperature range listed on the paint cans. I was worried the semi-gloss wall paint wouldn’t stick to the white plastic parts and it didn’t seem to be an issue after I used a clear primer spray paint first. 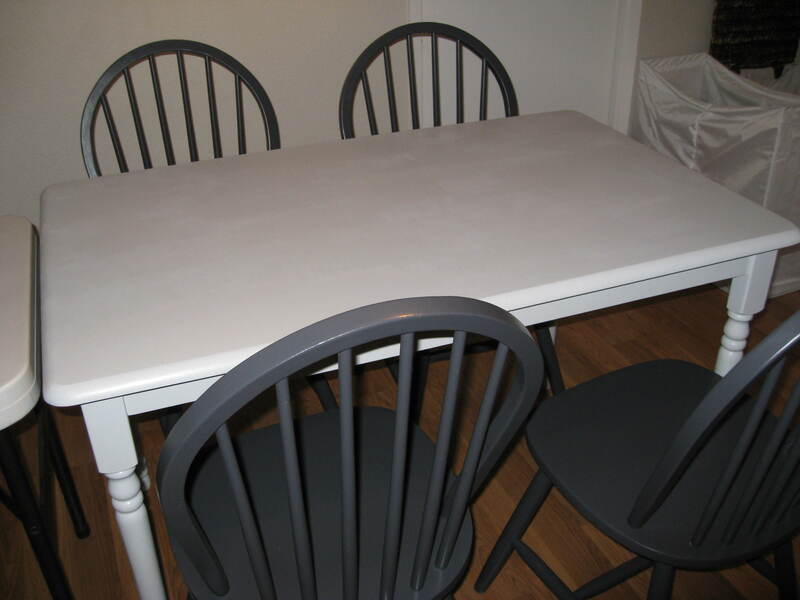 In regular real life light, the table is a light gray with a blue-ish tinge, and the chairs are a dark gray with a slightly purplish tone. I didn’t realize all the different tones of gray until I went to Lowe’s and tried to match the colors to two paint samples in a brand they didn’t carry. Orangey gray and purplish gray aren’t at all the same, for example. On New Year’s Day I was outside finishing up the table in my backyard, wearing jeans, flip-flops, and a bikini top while enjoying the sun, even getting a little sweaty in the 72 degree air. My hometown in Minnesota would experience -28F a few days later. 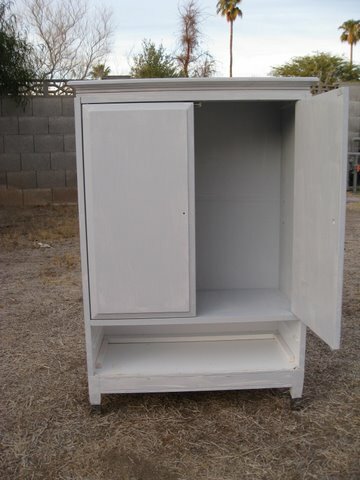 I also painted a small waist-high cabinet a friend gave me that she was going to throw away. I did this one the real way, actually taking off the knobs before painting rather than just dabbing paint around the handle and getting small bits of paint on the metal. (It’s outside drying, waiting to be put back together.) We use this cabinet next to the kitchen door leading to the garage to hold baskets of keys and wallets on top and kitchen towels, napkins, and all my aprons inside. January 6, 2010. 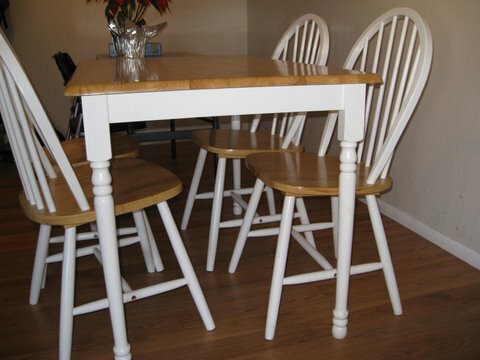 Tags: before & after, completed project, home improvement, refashion. Pictures, Projects, Words. 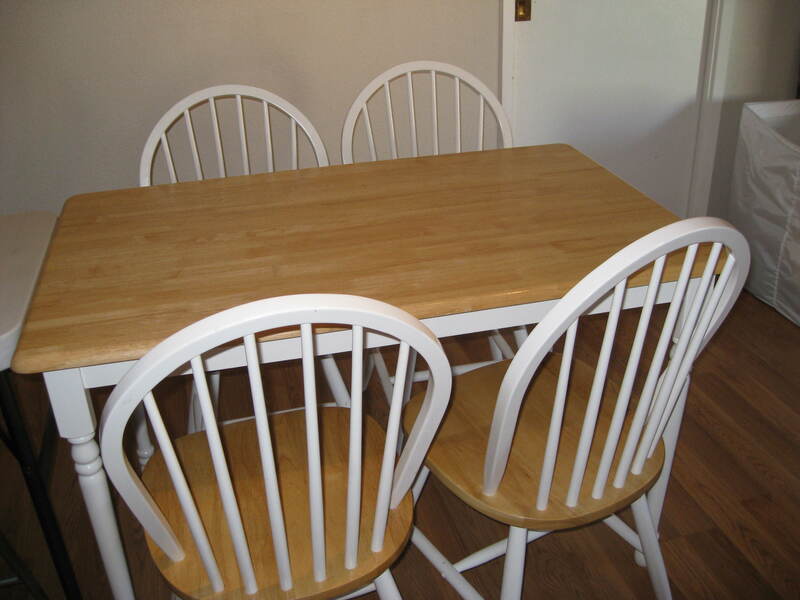 love the palm tree behind the nicely matching cabinet too (Bob is in Ortonville where schools closed from snow yesterday and today they are in MINUS 50 degree windchill and tons of wind and snow: we took him a used table and 5 painted chairs that need the same treatment). I love how your colors contain warm matching tones. January 7, 2010 at 6:33 am. Permalink. Amazing what paint can do! Great transformation. January 7, 2010 at 8:21 am. Permalink. January 11, 2010 at 1:44 am. Permalink. love the painting – i’m currently taking on amy own “HGTV” – I’m making a hybrid “Design on a Dime / Extreme Makeover Parker’s Room Edition” – its great – lots of painting. I’m really enjoying it. Must finish before Saturday afternoon when I pick “Dadda” up from the airport! January 12, 2010 at 8:51 am. Permalink. February 1, 2010 at 5:08 pm. Permalink.